To date we have slept in over 50 different earplugs (more than any other review publication), sleeping on our backs, sides and stomachs as well as tossing, turning and smooshing our ears into firm and plush pillows to determine which earplugs are the best for sleeping in. But if you want to know everything there is about earplugs for sleep, why we chose our top picks and why other earplugs fell short, then read on! If there are two things that shouldn’t mix it’s sleep and noise. In order to easily fall asleep, night-time should be quiet time. So why is it that when you put your head down on your pillow that the entire neighborhood bursts into life? Oscar, the downstairs yorkie, barking non-stop because his owner came home from work. The newlyweds upstairs breaking in yet another room in their newly bought home. Someone somewhere in our apartment complex snoring so obnoxiously loud that it’s making the building rattle. The Neighbors across the street putting their trash out on the curb. The idling exhaust of a sports car, music blaring, the driver waiting to pick up his Tinder date for some Netflix and chill. And my hubby wheezing through his congested nose beside me. While the best option would be to move to a quieter neighborhood, it certainly isn’t the most practical. And if I must be honest, that option is out of my price range anyway. And sleeping with with my head under the covers doesn’t help either. Fortunately, disposable earplugs are a practical and affordable solution to blocking out loud noises that keep you awake. If it wasn’t for the miracle of silence (or near enough to it) that properly fitted earplugs provide, I would never fall asleep. Earplugs don’t just rock at making your bedroom a silent oasis. Whether you are trying to snooze on a plane, catch forty winks at work or anywhere else where noise is preventing you from sleeping. And when paired with a good sleep mask to block out light, you will have the ability to fall asleep anywhere. Unfortunately, not all earplugs are created equally. There are as many different earplugs as there are different sized and shaped ears. It took a lot of trial and error before I found the best ear plugs for my ears. Trust me when I say this – there is no single best earplug to block out snoring. Finding the optimal earplug for you is very much trial and error. But you won’t have the same problem I had! We have done the hard work for you. We have tested over 50 different earplugs, from cheap drug store earplugs to high-end industrial earplugs. Our goal was to find the most comfortable, effective and highest quality earplugs on the market. So join us as we guide you through the good, the bad and the downright sucky of the earplug world. It was a hotly contested category. Which earplug would be best for most people? All earplugs were eligible, even those that won their own specific category. As you will discover, when it comes to earplugs you sleep in, industrial earplugs were unbeatable. And if you think about it, this makes perfect sense. Industrial earplugs are designed to not only be comfortable enough to be worn all day on the job, but protect your hearing from harsh sounds like jackhammers, saws and heavy machinery. Your partner snoring? That’s a whisper compared to what industrial earplugs have been designed to block out. So forget the nasty drugstore earplugs, which are not only more expensive (cost per earplug) but less effective and grab yourself a good set of industrial rated earplugs. It took some time, but eventually all of our testers mutually agreed that if they had to pick one pair of earplugs above all others, it was the Moldex Pura-Fit. Highest possible noise reduction rating? Check. Stays in all night? Check. As you are no doubt aware, ears come in all different shapes and sizes. And the Moldex-Purafit’s tapered design fit more comfortably into our testers varying ears than any other earplug. The foam easily compressed to a slim size and slowly returned to shape, giving you an abundance of time to fit the earplug to your ear. The rounded tip stayed straight and was easy to insert. And the best bit, they can be shortened with scissors. If you find the earplugs stick too far out of your ears, and touch your pillow, a quick snip is all it takes to reduce them to a more appropriate size. In terms of sound masking, they matched it with the best. NRR 33 is the highest noise reduction rating available for disposable earplugs. This is as good as it get’s when it comes to reducing sound in your bedroom. If you need to block out more sound, you are going to have to find an alternate solution (I suggest a white-noise/earplug combo). The earplugs go in and stay in. Back sleepers and side sleepers both noted how they could fall asleep with the Pura-Fit in their ears and remain there until the morning light. If you are looking for great earplugs to help you sleep and don’t know where to start, you should check out the Moldex Purafit. Unless, that is, you need a specialty earplug to sleep in. If that’s the case then read on, we have those covered too! Howard Leight Laser-Lite – Theres no hiding the fact that you are wearing these earplugs, the bright yellow and pink design are clearly visible, no matter how you try to hide them. That said, these were a very close contender for best earplugs. They are soft, comfortable and effectively block out noise. The only reason they missed out is because they are NRR 32 (as opposed to NRR 33) and cannot be inserted as deeply into the ear because of the flange. On the flipside, these earplugs are easier to pull out than our top pick. Great ear plugs and still worth checking out! If you have large ears or find that you earplugs keep falling out in your sleep then you might want the thickest, fattest earplugs around. The best fitting earplug for larger ears. Big, thick and comfortable. If you want a sturdy pair of earplugs for your giant ear holes then the Max are unrivaled. Dense enough to block out the loudest of sounds yet comfortable enough that they won’t disturb your sleep, even if you are a side sleeper! These earplugs go in and stay in. Even during those tossing and turning sleeps you experience. So what made the Max earplug beat out the hugely popular Hearos Extreme Protection, an earplug that many testers believed (before commencing trials) would take the crown. It all came down to the size, shape material. The Max was by far the easiest larger sized earplug to squeeze into the ear canal, thanks to it’s slightly pointed tip. When the earplug was compressed between the fingers, the tip was narrower than the smoother Hearos Xtreme, which made sliding the earplug into the ear canal much easier. Then there is the material. Since these are industrial earplugs, Howard Leight’s Max feature a smooth coating. This coating is designed to prevent dirty construction work fingers from dirtying up the earplug prior to insertion. But we were testing these for sleep. And this coating translated into getting more uses out of the earplugs before they would “gunk up”. It is worth mentioning that the coating also made the surface of the earplug slightly slipperier than the competition, which also made insertion easier. Combine all these features with a noise-busting earplug and you have our top pick for best earplug for large ears. Oh and they also come individually sealed, keeping each pair clean and hygienic. The Max-1 Earplugs are available in orange (pictured), pink and my personal favorite, USA! Unsurprisingly the smaller version of this earplug also won the best earplug for women (and men with small ears) category. Heroes Xtreme Protection – Thick and soft. That’s the best way to describe Heros Xtreme Comfort. Hearos came close to taking this category except that the foam surface was a little more grippy than our top pick. Combine this with the fat, rounded tip and inserting the hearoes was took a little more effort. But once you squeezed them in, they dealt with noise just fine. 3M E-A-R Classic Earplugs (310-1060) – None of the testers really liked the shape of the 3M’s E-A-R Classic. Flat shape of the tip means that it doesn’t compress quite as small as rounded tips, which can hamper an otherwise smooth entry when sliding them into your ear canal. The shorter size also prevented the earplugs from being inserted as deep into the ear. Sound dampening was not as good as the above two picks either. Flents Quiet Please Foam Earplugs – Testers liked Flents decision to make the earplugs a non-offensive cream color. It was a nice change all the obvious brightly colored earplugs. But that’s where the positives end, these are like a worse version of the 3M E-A-R Classic. Again, the flat shaped tip made inserting the earplugs more difficult than the bullet shape. The foam expands quickly and they blocked out the least sound out of the larger sized earplugs we tested. And to top it all off, a strong chemical odor assaults your nose every time you open the lid of the jar. Seriously, it’s intense! Important note: If you have larger or even regular sized ears then you will likely find the following ear plugs too small. This section is for small eared folk only! Comfy ear plugs are a must, otherwise your ear plugs are just another annoyance that will keep you awake at night. Unfortunately, as those of you with petite ears have probably discovered, an ear plug that is too big can do just that. A uncomfortable pressure inside your ear canal. You wake up with sore ears after wearing earplugs all night. The earplug sticks out too far past your ear. You cannot push the ear plugs into your ear canal. More often than not, it’s women who need a smaller sized ear plug. Perhaps this is why most of the small earplugs I came across were colored in bright pinks and purples. Truth be told there are not many purpose made earplugs designed specifically for smaller ears. While you can always make a pair of our other top picks shorter with a pair of scissors, you will likely want a solution that requires less effort. The best fitting earplug for smaller ears. The Max Small is just that, a smaller version of Howard Leight’s popular Max-1 Earplug. In fact, they may very well be the shortest earplug available. These earplugs are so short that the flange on the bottom is a necessity. Without it you would be able to stick these earplugs too far into your ears and never be able to pull them out. Despite the wider base, side sleepers didn’t notice a difference when compared with other earplugs. But perhaps the best part about these earplugs, for a small ear, is the slowly expanding foam. Rather than instantly spring back into it’s original shape (like some of the other earplugs did) the Max Small slowly returned to normal, giving you plenty of time to properly insert the earplug into a small ear canal. The coating on the Howard Leight Max Small earplugs is also the smoothest, meaning that the earplugs slide in easier than the others. Despite this, the earplugs gripped, remained in position the entire night and seemingly blocked out as much sound as the competition. Even though they had a slightly lower NRR. Good news for guys with small ears, the Max Smalls are also available in a more manly orange. But for those of you who wish to test these earplugs out before committing to a larger pack, you will have to put up with the pink colored “Super Leight For Women”, which comes in a pack of 14 earplugs. Despite the different name and color, they otherwise an identical earplug. If you choose the larger box of orange colored Max Small Earplugs you get the best value for money. And, perhaps more importantly to germophobes, come in individually sealed pairs. Small, comfortable and effective. Highly recommended. Mack’s Slim Fit Earplugs – If you have an impossibly small ear canal then Mack’s Slim Fit Earplugs are the narrowest on the market. While they adequately block out sound, we were a little disappointed with just how quick the foam expanded back to it’s full size. This doesn’t leave you much time to correctly position the earplug in your ear. Hearos Sleep Pretty In Pink – With a name like that you just know that these earplugs are targeted at women. Oddly enough, these were the largest women’s earplugs we tried. Many small-eared testers found the earplugs on the long side and had to cut a little length off. But if you can squeeze them in your ears then they are comfortable enough and do block out any loud noises as you lay down to bed. Mack’s Dreamgirl Soft Foam Earplugs – These were our least favorite of the earplugs, they expanded quickly and just didn’t appear to reduce noise as well as our other picks. This could possibly be because the earplugs have a hollow center, a bizarre feature we didn’t find on any other earplugs we tested. Note – Don’t confuse sensitive ears with small ears. If you have small ear canals then you may still find low-pressure earplugs uncomfortable. Check out our above picks for earplugs suitable for tiny ears. While all our testers tried out the sensitive earplugs for good measure, the opinion I was most interested in was that of our own writer, Emma. Emma did not want to test any earplugs because they cause here extreme discomfort. One that she describes as searing pain brought on by the earplugs expanding and pressing against her ear canal, making long-term wear impossible. And many other people are in the same boat. They do not consider earplugs a suitable option for blocking out noise while they sleep because the pain of the earplugs actually keeps them awake. A feeling of a dull ear ache. You feel immediate relief when you remove your ear plugs. The best fitting earplug for sensitive ears. While there were a few other earplugs that were just as soft, the Max-lite earplugs were by far the most comfortable. The soft foam easily compresses down and is slow to expand giving you plenty of time to squeeze the earplug into even the narrowest of ears. But by far the most impressive feature of this earplug is the feeling. With the earplug properly inserted, you can barely notice it is there. Once the foam expands and fills up your ear, there is nearly no more pressure. Even pressing on the exposed edge of the earplug that sticks outside your ear does not exert any more pressure on your ear. This is good news for those of you who are side sleepers, if your pillow presses into your earplug while you sleep, you won’t even notice it. Don’t be fooled by the unusual T-shape, the earplugs fit just as nicely into the ear as the regular ear plugs that don’t have a flange. We found that the flange actually made the ear plugs easier to grip, particularly by those with larger fingers, and easier to remove. Like most industrial earplugs, the Howard Leight Max Lite come in individually sealed packs of two, keeping them clean and hygienic until you need to wear them. We did notice that there was some slight irregularities at the very base of some of our earplugs, on the flange. But this only let the earplug down from a looks perspective. In practical use, the small bumps were not noticeable since this part of the earplug sits outside of your ear, and cannot be felt. Moldex M6600 Softies – Despite having 33NRR, the highest of any low-pressure earplug we rested, it came as a trade off. All testers commented that the Moldex Softies applied slightly more pressure than our top pick. That said, many people will find these earplugs “soft enough” and if you prefer a cylindrical shape, without the tapered end, then these make a comparable alternative. 3M Soft Yellow Neons (OCS1135) – Another 33 NRR Earplug that is effective and comes in both a regular and large option, something that the other brands don’t offer and may very well appeal to you, particularly if you have large ear canals. However, the earplugs are slightly on the short side at just 1 inch. If you stick these earplugs too far in, it can be a struggle to get them out. Flents Quiet Time Soft Comfort – If you have to choose a drugstore earplug that is low pressure then this is as good as it gets. While they are expand more aggressively than our picks above, they are readily available and will get you through a noisy night if you need them in a hurry. Side sleepers may find that they need to cut a little length off the earplug. Oh, and they come with a earplug storage case. Heroes Ultimate Softness Series – The Heroes Ultimate Softness fell short in multiple areas. Not only are they the worst value for money (cost per earplug) and they don’t come individually packaged but they wore out the quickest too. While sleeping earplugs are disposable, we found that the Heroes Ultimate lost their shape quicker than other low pressure earplugs. Another interesting note, despite a higher NRR (32) than our top pick, testers all stated that this earplug felt like it blocked out less noise. Mack’s Ultra Soft Foam Earplugs– Our least favorite. The foam expanded back the quickest out of all earplugs we tested. Combine this with the somewhat grippy coating and you have a low pressure earplug that is difficult to both comfortably and effectively fit in your ear. The shorter length didn’t do them any favors either. If you can get them inside your ears, they do an adequate job at blocking out sound, but no better than any other low pressure earplug we tested. With the advancement in soft foam technology, moldable wax earplugs are becoming less common. Not only do they block out less sound and feel greasy but also pick up dust and dirt, making them less hygienic to reuse. But they do have one thing going for them. If no other earplug fits your ear or you are looking for a hypoallergenic option that won’t trigger your allergies then you can always turn to wax. Wax earplugs are not designed to be inserted into your ear canal. Instead wax earplugs mold over the ear canal, forming a sound blocking barrier. Important – I feel it is important to stress that wax ear plugs are less effective at blocking sound than disposable foam earplugs. If blocking as much sound as possible is your only goal, then skip over wax earplugs. Now it may surprise you to learn that the ideal wax earplug is not actually made from wax, but rather a silicone putty. The main reason for this is that wax ear plugs are not actually the most suitable option for sleeping. And if you are a side sleeper, you will see why. Sliding your ear across your pillow while you are sleeping results in a waxy buildup appearing on your pillow. And it’s difficult to remove unless you wash your pillow case in hot water. As far as soft, moldable earplugs go, the Mack’s Silicone Earplugs check all the boxes. Easy to fit to your ear, stay in all night (even for side sleepers) and if you keep your ears clean and only touch them with clean hands, you will get multiple uses. And most importantly, for side sleepers, the ear plugs will not mark or stain your pillow. Sleeping with the earplugs is a comfortable experience because the silicone covers your ear rather than being inserted into it. While the sound it blocked out could not compete with a traditional foam earplug, there was a noticeable reduction to the point where sleep came easily. While all are extremely similar, we preferred the clear Pillow Soft variety. Not is it more difficult for someone else to tell that you are wearing ear protection, but they appeared to be more sticky. The stickiness helped form a better hold in the ear. Hearos Multi-Use Silicone Earplugs Very similar to our top pick. The only reason they lost out is because they are slightly smaller and only come in a single color. While they are 21NRR vs. 22NRR of our top pick, we couldn’t notice a difference in noise blocking. BioEars Soft Silicone Earplugs Similar to the above silicone earplugs but you only get three pairs per pack. While they claim to be antimicrobial, inhibiting the growth of micro-organisims, the effects were not noticeable. Testers believed that if this was a necessary feature of ear plugs then larger companies likely would have jumped on the trend long ago. Ohropax Classic Wax Ear Plugs – If you simply have to go traditional wax then look no further than Ohropax. Like all wax earplugs, they come wrapped in cotton to prevent them melting together, this must be removed, which can be a little bit fiddly. The wax was easy to mold when body heat was applied and remained in the ear all night. Quies Pure Wax Earplugs – While it may be made in France, this did not benefit Quies earplugs. Similar to the Ohropax above but it does not come with English instructions. Flents Ear Stopples – The hardest wax of the bunch. It was difficult to mold, even with body heat and does not conform as well to the ear as other wax ear plugs we tested. Multiple testers also noted that these earplugs felt greasier than the others. The only way to guarantee the perfect fit for your ear is to mold it yourself. While regular foam ear plugs are designed to fit as many different ear shapes and sizes as possible, molded ear plugs are designed to only fit yours. And because molded ear plugs form a perfect fit, they do not fall out while you are sleeping. Now you may be wondering why everyone doesn’t just rush out and purchase molded earplugs. There is a reason for that, you can’t simply shove a molded ear plug in your ear and fall asleep. Before you can use a molded earplug, preparation is required to ensure a perfect fit for your ear. And this process can be somewhat tricky. If you don’t mold it correctly to your ear then you will be stuck with an earplug that doesn’t fit correctly. If that happens you will have to purchase a new molded ear plug kit and start again. And that doesn’t come cheap. The best fitting and most comfortable mouldable earplugs. Yes that odd shaped looking thing is actually the perfect shape to slide neatly inside my ear and ear canal. You simply Can’t go past Radians for both comfort and sound dampening. They might not be pretty but they certainly get the job done. In the packaging you will find two separate tubs of silicone, one colored and one white. Mix the two together, push the putty into your ear and wait ten minutes for it to set. And just like that you have the perfect fitting ear plugs that won’t fall out in your sleep. If you get the right fit then the sound masking is as good as any foam ear plug we tested. And as you would expect, the ear plugs custom shape means that it does not apply any pressure to your ear after you have inserted it. Big ears, Small Ears. No Ears. Whatever the size or shape, these ear plugs will do the job. If you sleep on your side you may find that the back of the earplug sticks a little too far past your ear, which may feel uncomfortable when you rest your head on your pillow. Fortunately, once the rubber has cured, you can simply cut away the excess with a knife. Now I must warn you that these are one-shot earplugs. If you do not follow the instructions to the letter, or do not correctly fit the silicone putty to your ear then you will have to buy a new pack to start again. Fortunately, if you take your time and follow the instructions the whole process is dead simple. I only have one complaint, and it’s pretty minor – I wish Radians included a hard plastic storage case instead of the cloth bag, since it attracts dust. The following molded ear plugs fell short in one way or another. Decibullz Custom Molded Ear Plugs – While they may look great, these ear plugs were disappointingly more form than function. The Decibullz headphones rely on you using an ear plug and molding a “seal” around them. As a result, the earplugs do not offer a true fit for your ear canal. The custom-fit seal feels more like a hard plastic than a comfortable rubber and was less comfortable to sleep on then our top pick. Instead of The only advantage is that you can remold the ear plugs if you make a mistake, since the ear plugs are boiled to become pliable and harden as they cool. Ahead Custom Molded Earplugs – Similar to Radians in that you combine two materials to form a rubbery plastic. It might have been my imagination but the two materials seemed more difficult to combine than that of the Radians. Coming in at twice the price, for a similar experience, we couldn’t recommend them. We added this section after receiving many reader questions as to our thoughts on Mack’s earplugs. 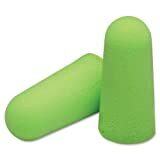 If you have ever stepped foot in a retail store you will likely have seen Mack’s extensive range of foam earplugs. You can find Mack’s earplugs at just about every drugstore, Walmart, Walgreens, Target etc. in the country. You may have noticed that with the exception of the wax earplugs category, Mack’s failed to take out any category for the best foam earplugs. You may have found this surprising. I know I did. Especially given that Every Mack’s box clearly states that Mack’s Ear Plugs are the “#1 Doctor Recommended Brand”. So if Doctors are recommending Mack’s Ear Plugs more than any other brand, then why didn’t testers pick them as winners? Given that Mack’s entire range of earplugs are disposable, if you wish to continue using ear plugs to sleep, you will need to purchase them on an ongoing basis. Cost per Earplug, Macks were some of the most expensive on the market. Using Amazon as a price guide (the cheapest place we could locate Mack’s ear plugs) you can see the price difference compared to our top picks. Considering the remarkable difference in quality between the industrial rated earplugs we tested and Mac’s, those who are looking for an inexpensive earplug for sleeping would be better served by industrial earplugs. At the end of the day, Mack’s earplugs were bested by nearly every other earplug in each category in terms of comfort and performance,as rated by our team of testers. If you need earplugs in a hurry because an unforeseen sound is keeping you awake, in which case Mack’s are readily available at the majority of drugstores. But if you are planning ahead, for a good night of quiet sleep, we recommend checking out the competition. Heroes were one of the most highly rated earplug range on the market. Annoyingly, in 2016 Hearos decided to change the size of and shape of many of their most loved ear plugs. And not for the better. This was a huge error on their part which saw many customers outright reject the new design completely. Speculation on my part leads me to believe this was nothing more than a cost-cutting measure. Having used both the old and “new and improved” version of the Sleep Pretty In Pink, the new model appears to be poorer in all aspects – Worse noise reduction, a poor fit, don’t compress well and expand too quickly. There also seems to be a lack of quality control on the finished product. My earplugs were misshapen and many were different lengths and thicknesses. Fortunately, Hearos have seen the error of their ways and have reverted their earplug range back to the original style. But this just leaves one problem. There is still stock of the “new style” floating around both in retail stores and online. So be mindful when buying Hearos earplugs that you want to buy the original style. Phew, if you are reading this sentence then you have made it through our detailed guide on the best earplugs for sleeping. What earplugs do you sleep with? Let us know in the comments below!